Today i am sharing with you the best keylogger software to hack email accounts or passwords and much more. I only limitation of this keylogger is that you need to install it to victim server that means you require physical access to the victims PC at least once. 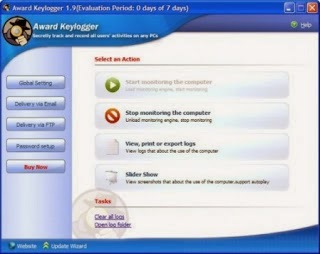 The keylogger that i have rated the best one from all available keylogger is Award Keylogger and why so, its not because of it's recording keys feature but because of its extensive features and ease of configuration and installation. It not only monitors the key strokes and send them to email or FTP server but more than that it also captures the screen shot and biggest thing is that its 100% undetectable. None of the antivirus can detect it. What you need to hack email accounts and other website passwords of any victim is that is you need to install it to his system.